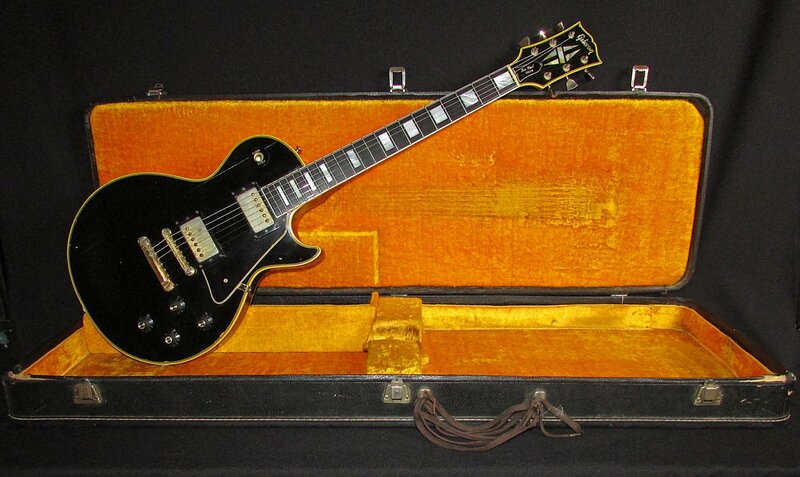 1969 Gibson Les Paul Custom is in excellent condition and perfect playing order. Comes with the original rectangular Gibson hardcase. The handle broke off at some point and was replaced with a shoe lace. This awesome Les Paul Custom has been professionally refretted by Joe Glazer, as well as a new carved bone nut installed. At some point in it's life, an out-of-phase switch was added in the middle of the of controls. It was doweled and finish matched very well. This Les Paul is also a factory 2nd, with a "2" stamped in the back of the headstock, below the serial number. Otherwise it's all stock! Stock bridge and nylon saddles, tailpiece, pickups, tuners, pots, pickup selector, knobs, pickguard, output jack, and jack plate. The finish has thick lacquer checking everywhere. The top, sides, back, back of the neck, and the front and back of the headstock. Tons of cool, old, vibes are loaded in this beast! The D and G string tuners are a little bent but still function perfectly. The seam line on the top has made the finish separate underneath the pickup selector. There's dings and chips throughout the finish. A few on the top, a couple on the back, and one on the back of the neck behind the G string at the 4th fret. Like all Customs, it has an ebony fretboard with Mother of Pearl block inlays. The neck is a medium C style, where it's close to a 60's slim taper, but has a little more beef to it. The word has been well aged and dried out over the years, leaving this guitar extremely rich and resonant! Has a 1 5/8" nut width, 24 3/4" scale length, and weighs 9 pounds 14 ounces.